Updated Virgin Media is seemingly suffering a series of outages accross the country, with aggrieved customers using alternate methods to air their ire at the telco. A number of Virgin's customers have been in contact with us over the past day or so to complain about not receiving the service they have paid for. "All I could get from their customer service was that it was a major outage affecting area 3, which is South London," Reg reader Barry told us. "I can't believe they have not admitted the scale of the problem or offered any apologies never mind compensation on their website." A quick glance at Twitter showed more than the expected volume of outage complaints, with affected areas stretching across the country. @virginmedia I have no TV or Broadband in the TW15 area, do you have an update on this ? @virginmedia our broadband isn't working. Is there an issue in the Marchmont, Edinburgh area? 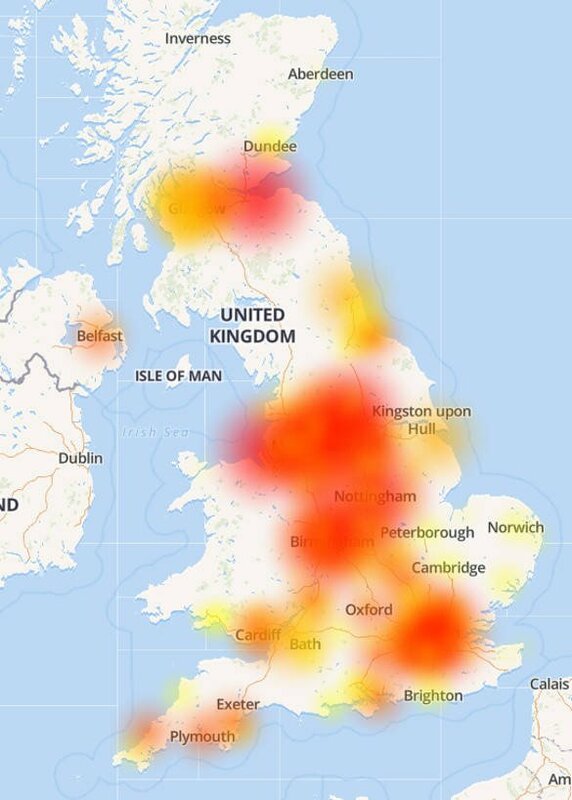 Meanwhile, the ever-reliable Down Detector website's heat map of outage reports from across the country made pretty ugly viewing for Virgin employees.